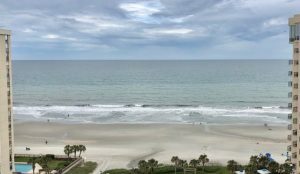 Myrtle Beach, for the second year in-a-row, was the site for a seminar and retreat for the Ohio Association of Criminal Defense Lawyers (OACDL). I intended to go last year, but the timing didn’t work with my schedule. When it came up again this year, I made the event a priority on my calendar. I’m so glad I did. The unique seminar format, the interesting topics and the camaraderie made for a great experience. The continuing education part of the retreat was unique. Rather than having the room arranged like a classroom, the tables were set up in a rectangle, like a meeting. It also didn’t hurt to have the beach as a backdrop. The speakers, rather than giving a monologue presentation, facilitated lively discussions. One topic we discussed was marijuana. The Ohio legislature passed a law two years ago permitting the use of marijuana for medical purposes under certain circumstances, but the regulations for the details of medical marijuana have not been finalized. Nevertheless, some Ohio doctors are already ‘prescribing’ marijuana to patients who are Ohio residents. As more Ohio residents will be using marijuana, we expect to see an increase in marijuana-related DUI / OVI cases. Ohio OVI law was not changed when the medical marijuana law was passed. It is unclear whether medical marijuana users will have a defense to ‘per se’ marijuana laws which make it illegal to drive with too much marijuana metabolite in one’s system. It will definitely still be unlawful for a medical marijuana user to drive under the influence of marijuana. Professionalism was another subject we discussed. One topic in the Ohio Rules of Professional Conduct is “fees and expenses”. We had a spirited debate about fee agreements, as it seems the Rules and their interpretation continuously change. I use a written fee agreement in every case, and I use language directly from the Rules in my fee agreements. I want there to be no misunderstandings between clients and me about all the details of our agreement. The Ohio Rules of Professional Conduct also address a lawyer’s competence. Rule 1.1 states, “A lawyer shall provide competent representation to a client. Competent representation requires the legal knowledge, skill, thoroughness, and preparation reasonably necessary for the representation.” I have observed lawyers with questionable competence in the area of Ohio DUI / OVI defense. It is a practice area with complexity which surprises many attorneys. That complexity makes it critical to attend continuing education. One great source of continuing education is the Ohio Association of Criminal Defense Lawyers (OACDL). In addition to the annual OVI seminar discussed elsewhere in this blog, the organization presents many other seminars throughout Ohio every year. I am honored to serve as the Secretary for this organization. This event was not all about education. It was also considered a retreat for the OACDL board of directors and was open to all OACDL members. Despite the uncooperative Myrtle Beach weather, the ‘retreat’ aspect of the event was as good or better than the educational piece. It was good to get away from the day-to-day work of a law practice. That always helps put things in perspective and re-charges batteries. So does camaraderie. The attendees socialized together each evening: we created and deepened connections with other criminal defense lawyers from across Ohio. I should have gone last year, and I will definitely be there next year.